The Beat Switch Text allows a source text property of a text layer to react to more than one beat simultaneously and to show a different text for each of them. must be linked to the first beat signal on which the text should react. is the text t hat the text layer should show when the first beat is active. must be linked to the second beat signal on which the text should react. is the text t hat the text layer should show when the second beat is active. must be linked to the third beat signal on which the text should react. 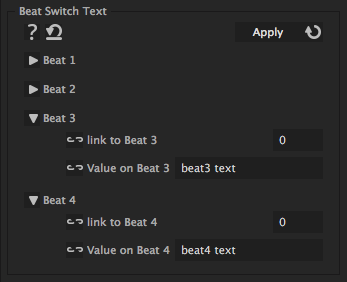 If you need less than three beat signlas you can leave the default value 0.
is the text t hat the text layer should show when the third beat is active. must be linked to the fourth beat signal on which the text should react. If you need less than four beat signlas you can leave the default value 0.
is the text t hat the text layer should show when the fourth beat is active.